Three conversations made me think of church planters this past week. This first was an unexpected encounter with an old friend who has been leading worship for a church-plant. He was, at once, exhilarated and exhausted by the work of setting up a mobile church service every week and watching it grow to well over a thousand people in a little over a year. The second was a lunch I had with a worship leader in town that same day who told me that he had considered planting a church in the future but was intimidated by the enormous pressure and work that comes with planting. I listened to both wondering if church planting was doomed to be a herculean task. The third conversation came a few days later, though it was not truly a conversation for I was only the listener. I heard a speaker introduced as the pastor of the "fastest growing church in America", a man whose church has increased on average by more than a thousand people a year over the past eight years. It is a remarkable accomplishment and a tribute to his leadership. He is a rare breed. Then the three conversations on church planting wove together: Maybe some church planters are exhausted because they're trying to be the next mega-church. Here, I must confess my ignorance. It very well could be that church planting is inevitably as exhausting as any start-up business. But then again, why should a church plant be like a business? Why is there this torrid current of busyness and business that pushes pastors along, convincing them to do more and grow more quickly? 1. Don't trust your vision. You've probably never heard anyone say this before, but it's quite Biblical. Jeremiah tells us that the heart is deceitful and desperately wicked (Jer. 17:9). James says that wars and strife within a church come from the lusts that rage in our own hearts (James 4:1). Peter spoke for all the disciples when he asked what they would get out of following Jesus (Matt. 19:27). And twice, Peter, following his own vision of how Jesus would carry out the Father's will, acted hastily and incorrectly: rebuking Jesus for talking about death on the cross, and cutting off the ear of the High Priest's servant. In general vision is good, but the overall untrustworthiness of our own hearts and ambitions needs to be factored in when determining if our vision is actually God's. Many desires have been christened as vision because of too much trust in ourselves. In short: Just because you want to, doesn't mean you should aim to. 2. Don't maximize your potential. 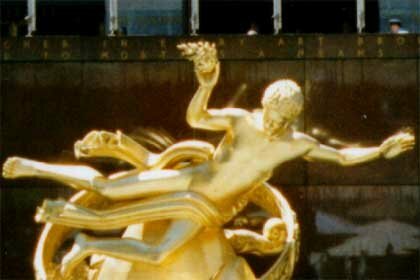 Zeus was allegedly upset at Prometheus for many reasons, not the least of which was that he gave power to humans who lacked the wisdom of the gods. It might seem familiar to the Eden story of Adam and Eve gaining knowledge of good and evil and then being prevented from the eating the immortality of the Tree of Life. Sin has a way of aggrandizing our perception of our potential. Technology has made us capable of doing many things that were previously impossible. I am grateful for most of these things. But technology has also given us the illusion that we can do more than we actually can. It inflates our ability beyond our capacity. We can blow up the world so we think we deserve to rule it. We can set up a video campus and people will come, so we think we can pastor on a national scale. We can broadcast talks and people will listen, so we think we are creating disciples of Jesus. But it's a ruse. We are like balloons filled with too much air, believing that we can reach the moon, when in truth we are a few puffs away from bursting beyond repair. In short: Just because you can, doesn't mean you should. "I made them stop focusing on their own mortal limitations," Prometheus said. How true for all of us today. With energy drinks for the masses and steroids for culture's most-watched performers, we are taught to aspire to a life without limitation. But this is not what Jesus called "blessed" when He praised the meek– those who have strength under control; those who have the ability to do much but have embraced their limits. James, after warning us about the way our desires mislead us, writes that we are not to say that we shall go to this city and do this business and plot our life as if we had no boundaries. He reminds us that we are but a vapor, that everything must surrender to the will of the One Almighty God– the only One who has no limits (James 4:13-15). In short: Let God be God. And now a word about Jesus. It may not come as a surprise that Jesus did all these things in His ministry on earth. He did not trust His own "vision", when in the Garden He prayed for the cup to pass, but said to God's glory and our eternal good, "Not my will, but Thine be done." He did not maximize His potential when He refused to turn stone into bread, or to jump from the Temple's peak to show, in the center of the city, what God could do.He turned down the limelight, spending most of His ministry in fishing villages away from bustling cities stained by Herod's garishness. As Philip Yancey rightly said, His greatest miracle might have been the "miracle of restraint." Jesus embraced His limits when He laid His life down, learning obedience through death on the cross (Heb. 5:8). His 33 years on earth were not to be marked by victory but by humility and death. And through that death has come a life that truly know no limits, the God-kind of life. I once heard from someone who was probably taking the greek stories a little to metaphorically that the vulture that was assigned to eat Promethius’s liver every morning was actually a metaphor for alcoholism. I thought that was interesting, and quite applicable since so many pastors grow and grow, burn and end up alcoholic and out of the ministry. so Glenn this article kind of makes it feel like you are anti-church plant. is that true? carl- interesting thought on the bird representing alcoholism….doubtful if it was the orginal idea, but, boy is it a poignant picture of the many addictions over-worked pastors fall into! josh– nothing could be farther from the truth. i LOVE that new churches are being planted. i love when existing churches become “sending” churches. it seems healthy and “Kingdom-like” to me. i just think there might be some questions to wrestle with in the process of planting so we aren’t automatically replicating systems and machine-like structures that may not be best. certainly, there are many church planters who have done this in admirable ways…and i am watching and learning. “fastest growing church in America”… It is a remarkable accomplishment and a tribute to his leadership. Please, Glenn, my brother… Stop using world math. You certainly have little power to change others but you are much too wise to buy the line “more is better” and promote that mindset. Gideon’s army, and Jesus’ words should be all you need to recognize that “less is more” and headcount more likely means compromise, pandering, and ear tickling than a “tribute to one’s leadership.” NLC is only one example, and I’m not casting stones at the mega-church, just at your mathematical equation for success. You’re a pastor and certainly can’t say these things, but I can. I have this to say to you: relatively, person-for-person (14,000/11,000/8,000 whatever it is these days), NLC’s impact on the world is shameful evidence of inward focus and self indulgence. Your recent restructuring looks more like a bailed out bank than a church. Your productions “The Thorn”, etc… are preached and promoted as evangelism but really boil down to catering to a niche entertainment market. And the “good ole boys” club is as alive and well as ever there. Good news for you though, if your book hits the best seller list, you know like Da Vinci Code and such, it probably means you missed any significant message. So let’s hope it doesn’t okay? I sure hope you really believe this message you are trying to spread, and I hope you’re willing to follow through. The rabbit hole goes much deeper! GREAT POST Glenn!!! I will be chewing on this for the months ahead. I am not a fan of the megachurch. I think that they perpetuate values that are not consistent with the life Christ has called us to live together. But to say that “NLC’s impact on the world is shameful evidence of inward focus and self indulgence” is not accurate. I am not defending NLC, but I don’t think you really know the impact of it. I have lived in Turkey and China and I can tell you that people associated with that fellowship have attempted to make an impact in these places. One should be careful when one makes such sweeping generalizations. Shameful is a very serious word and I am sure that all of us, all of our fellowships will at the end of time respond like Oskar Schindler at the end of “Schindler’s list”. Our failures and shortcomings, our selfishness and weak effort, will be completely evident. And we will stand ashamed for what we could have done. It is obvious that you have been hurt or offended. You have an axe to grind. I pray that your heart is healed. That said you have some good points about approach and congregation size. Entertainment ought not be the principle method of evangelization. Our success ought to be determined by the strength of our commitment to our God, by our lives reflecting his glory and holiness, by our words and actions overflowing with love. A pastor ought not be applauded when the congregation grows. A shepherd isn’t successful when his sheep have babies or when he steals from other herds, but he is successful when all of the sheep return safely to the village.Growth isn’t success. Prayer, repentance, holiness, love, peace, fasting, and perseverance are attributes of successful pastoral leadership, not congregation size, cool music, catchy sermons, or beautiful buildings. glenn, I hear what you are saying and I totally agree with you. the largest danger is to just assume that what you have been a part of it ‘what works’ or worse ‘how God does things. . . ‘ interesting. This is a great post, that has inspired a lot of thinking on my part! thirsty– thanks, bro. and hearty amen to your thoughts on size and our culture of entertainment. i’m going to say more on this to “wind”. wind– i’m sorry you feel this way about new life. not sure if you are an insider or an outsider looking in, but like you said, i have “little power to change other”, least of all someone who is unhappy with my church. as to size and growth: please mark that i never said what i thought about a pastor of the “fastest growing church in america”. i never said that was a good thing nor did i decry it as evil. i am trying to resist stone-throwing…especially at a house i don’t know. Growth is BIOLOGICAL not NUMERICAL. LIVING THINGS GROW…and LIVING THINGS HAVE LIMITS to their growth. a human being that keeps growing, we would call obese. a tissue that keeps growing is a tumor. so, what is the “perfect” sized church? i don’t know. but i do agree with some of what you are saying– and all of what “thirsty” is saying– that these a questions a pastor must wrestle with prayerfully, without the folly of equating size with sucess. while i share your suspicions of things that get too large or books that sell too well, it isn’t a fair equation to say that that which is popular is always devoid of content. what then are we to do with the fact that the Bible is the best-selling book of all time? anyway, i love thoughtful discussions and disagreement. but i don’t care for personal attacks and sweeping judgments. correct people whom you know and love– and do it face to face. don’t damn every big church to hell from your laptop. please, i think you can do better than that. I appreciate all that has been said, and frankly I think I’ve been, probably logically, miscategorized. I’ve been quite an insider in varying capacities, including staff, since NLC was a warehouse. Still am, though I live much too far away. 1. I did not damn anyone. 2. I did not personally attack anyone, unless you honestly can sum the entirety of NLC’s corporate identity into a person. 3. It was an exaggeration for me to say “missed any significant message”, and I apologize. 4. thirsty summed it up nicely on the shame issue, we will certainly all be ashamed at some level. I stand by my use of the word and am well aware of how fruit is defined at NLC. I just do not agree with it. I will leave it at what I’ve said, despite having much more to say. I appreciate that you’ve read what was written. As far as F2F goes… Been there, done that. I know better. 😉 There are far too many fans to make time for to waste time with critics. A problem only mega-churches can claim. The small church has the other problem. Everyone is a critic eh? God be with you Glenn. My message-via-laptop was delivered out of respect for you and hope for your ministry. Your message demonstrates an unwillingness to submit completely to the flow that is pulling the American church into irrelevance, either via death by atrophy, or death by self-indulgence (iow:”finding your life to lose it”). Offended with my message or not, may God use you beyond your abilities! Really good thoughts and contradictory to the common “Mc Church” franchise mentality that permeates our sub culture. Allow me, if you will, to add something to this discussion from the perspective of the church planter. “No one will ever know the pain that comes with pouring your heart into people and the dream of a community and then have every one of your motives questioned and your every facet of your life criticized. Unfortunately, many pastors forget “why” they started and allow the affirmation of trusted, safe voices (ie. other pastors) become their security and identity. I don’t believe we should give up on the idea of planting churches or even growing churches. I think we need to re-evaluate our motives and clarify the “win”. I truly believe when there is a transformation in the hearts of leaders in the church and a change in our math, we may see the largest churches yet to come…for all different reasons. wind– thanks so much for the clarification. upon a closer reading, you’re right in saying that you did not damn the mega-church to hell nor personally attack anyone. i’m sorry for saying you did. my attempt at hyperbole was likely evidence of being overly defensive at some of your statements…which are biting– calling NLC a warehouse and assuming all pastors at NLC judge fruit by increased numbers…after all, i’m still there aren’t I? 🙂 i appreciate your heart for me and the encouragement….it does make me curious who you are! lee– i am SO GLAD you took time to write. i’ve been wanting to pick your brain about many of these thoughts for a few weeks now. thank you, thank you, thank you for your perspective. i suspected it was a bit naive to insinuate that there was a way of church-planting that wouldn’t be exhausting, but i do wonder if it becomes more so unnecessarily. also, i trust you know that i 100% for church-planting and hope to do so myself in the right time…that is why i am wrestling with these thoughts. a long phone call some time? I don’t mean to be “biting” you, just biting into some tough questions and possibilities. I don’t mean to wear out my welcome here but I’m not sure I said that either. NLC corporate, has historically judged fruit by success which was my initial assertion. I am certainly not saying that success is not a good thing, but it is not the bottom line. There is a real possibility that for both the church and you and your book, contrary to human standards, that failure may be exactly what will produce fruit. There was an ex-pastor at NLC who wrote a great book but it didn’t sell well. Is he a failure? I can tell you for sure no. In fact in that process he has established firmly a specific vision and is living it out to this day. Birthed from the writing of that book. I would bet we actually do agree here. I am just also aware that NLC proper has allowed many unfruitful programs to continue because they were successful and the opposite has also been true far too often. Yes an apparent failure can be exactly what needs to happen. NLC is not alone in this logic. Just realize that digging a big hole that causes people to fall in, could be called successful by some, if it manages to collect a lot of people. To others it would just be called a trap. Anyway, I hope to convey to you that sinking or swimming with this doesn’t prove anything. Very little we do proves anything. I love where Jesus talks about the good and bad trees and how good trees cannot bear bad fruit and vice-versa. What a crock eh? Seriously, that can’t be true right? If I ever bear bad fruit it means I’m a bad tree, but what about the good fruit? Just one piece of good fruit, using the implied logic, would mean the tree is good. The crock isn’t what Jesus said, it is our terminal inability to know the difference. Anyway, God bless you. You don’t know me, doubt you’d even recognize me, but I have appreciate your contribution to NLC. Absolutely Glenn. I would love to talk at length about this. I am really looking forward to hearing about some of the things you read about and are processing after your sabbatical. Let’s connect this next couple of weeks and chat. Glenn, you’re taking it on the chin quite a bit for something that you have publicly opposed, by someone wearing a mask; and you have done so with good-natured responses. That tells me a lot about you. I have never been a member of NLC, and have sometimes been a critic; however, for the record, I think your assessments are right on the money here. NLC has had many positive contributions to the community that are both lasting and unsung. While I agree to a certain extent with Wind’s initial point (large numbers are not the right way to measure success), it is yet still important to take measure impact. Jesus is recorded as feeding 5,000 people, starting with just 5 loaves and 2 fish and having 12 baskets of leftovers. He clearly did the math. Scripture takes stock of both the big and the small. 120 people prayed on Pentecost and 1 man preached a sermon that resulted in 3,000 being saved. The point that you have made well is that we should be busy with the small things of kingdom business on a personal level and let God work out the math. The problem with the mega church, is the same with the mini church: Most people are letting someone else “do Christianity” for them. They want to log 20,000 Sundays in a pew as if that alone has merit for an eternal reward. Few are actually pressing in to the Kingdom and allowing Christ to challenge them to live by faith. That was the same in the Apostle Paul’s time, the same in Moody’s time and it hasn’t changed now. People want a simple prescription. It is easy for the critic to say “the church is doing it wrong” yet not personally be busy doing anything to impact the world, their world. Most of the time I find that people who find things to blame and shame are themselves shameful and blameworthy – but are obscure enough that no one knows. If the critic were busy dealing with their own business and walking by faith to see God’s deliverance, they would be too busy to criticize. WE who the redeemed are the church! Regardless of the size of your fellowship. If there is something wrong with the church, it is often because WE have not taken stock of our own numbers; it is because WE have failed to account for our own responsibility to the Lord and to our neighbor. It doesn’t matter whether a person attends a small church or a huge one. What matters is whether we are seeking God and following His call on a personal level. In reading your book Glenn, I find myself convicted to take account of my own personal relationship with God. I find myself convicted to stop believing the rumors and urban legends of God. Having never been a member of NLC, I could easily ignore what you have learned and disregard your message with an “I could have told you” attitude. Instead, your message is hitting me right between the eyes. Yes, I need to keep seeking revelation from our Father and I need to keep seeking the way of my Savior and I need to keep letting the Spirit teach me how to follow that revelation of truth. Because the fact is, only God can reveal the truth of what I need to hear and only God can use that truth to mold me for his purpose. Your message is timely and impacting. I also think it is humorous that you used Prometheus as a backdrop for the message. Ha. Irony.